Singing bowls are bells. The best tone is produced by striking the side of a singing bowl just at the rim with a soft mallet. They can also be played around the rim to emphasize the harmonic overtones. Below are instructions for both techniques. Each Himalayan Bowl is unique, and the best playing techniques either as part of meditation or just to enjoy a few minutes of peace. Sound is very beneficial to our health and well being. The warm tone, gentle vibration and subtle harmonic overtones provide many subtle benefits. The following guidelines will help you learn to play your Himalayan Bowl with skill and ease. To begin, sit comfortably on a chair or on the floor. You do not need to sit any special way. Your comfort is most important. Go up and down your spine, imagining that you are like a blade of grass, growing straight but soft and movable. Notice your breathing. Allow your breath to come and go without pushing or holding. Hold the bowl in both hands for a few moments. Feel its shape, weight and temperature. Feel the shape of your hands as you hold the bowl. Try to reduce the effort in your hands, wrists, shoulders, ankles and feet. Sit calmly and contact the bowl and the ground gently. Before playing, try this short meditation for compassion: feel your breathing and imagine that with every breath, you fill up with the light of loving kindness. Gradually light fills you more and more, dissolving all tension, blocks, fears and limitations. The light overflows from you and fills the bowl. Imagine that light and love fills the bowl, more and more with every breath until it is overflowing. Light and love overflow from you and the singing bowl, filling your surroundings. Expand your awareness wider and wider until this compassionate love and light spread throughout the world. This is the way to benefit all living beings. Send that loving kindness out to the world as a gift. 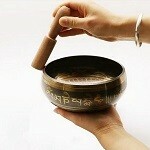 When you play the singing bowl, the sound the vibrations travel outward from the bowl in all directions. Himalayan Bowls can be played around the rim with bare wood or a leather wrapped mallet. Wood emphasizes the high harmonics. Leather emphasizes the low tones. The wool mallet is for striking only. You cannot play around the rim with the wool side – only the bare wood or leather. Hold the mallet against the rim of the bowl. Hold it firmly, but with a relaxed hand and wrist. Keep your hand low on the stick and close to the bowl. Many people hold their hand several inches above the rim of the bowl which makes it more difficult to play. It is the pressure that makes the sound. Slowly run the mallet around the bowl with constant even pressure. If the bowl makes a rattling sound, slow down and apply more constant and even pressure. Go slowly and listen to the sound rise. If you keep even pressure, the vibration will gradually build to a strong tone within a few seconds. The sound will continue to grow until the bowl will sing at its fullest volume. At this point, vary the speed – go slower to make the tone less intense, go faster to get it more active. If you let up on the pressure, the singing will stop. In that case just start again, slowly building if you have trouble singing your bowl. Experiment with your grip. I prefer to hold the mallet like a pencil, with my fingers pointing downward. Some people prefer to hold the mallet with all fingers gripping it, like you would a mixing spoon or baseball bat. Experiment with the angle of the mallet – hold the mallet straight up and down or at a slight angle. Practice until you find the speed and pressure that allows you to sing the bowl indefinitely. Find the balance of speed, pressure, and angle where the bowl sings to its fullest, rising and falling, vibrating continuously and joyfully. Strike the singing bowl with a soft mallet, like our wool wrapped mallets. Our large beaters are for larger singing bowls, over 9 inches. You can also strike the bowl with bare wood to get a more percussive tone and to emphasize the higher harmonics. Strike the bowl from the side, but at the rim. If you strike it too far down the bowl, it will not vibrate fully. If you strike it from above, it will not vibrate much at all. The harder you strike it, the louder and more powerful the tone will be. If you strike it too hard, the tone can become metallic and unpleasant. Find the middle ground where you give it a firm strike, but not too hard. Notice that the sound and vibration can be slightly different depending on where you strike the bowl and how hard you hit it. The tone also varies with different diameter mallets and different materials. New bowls especially vary quite a lot – the tone can vary by a partial tone. The quality of the vibration also varies depending on where you hit it. One spot may have more warble than another. One spot will sound more deep, one spot will emphasize the highest harmonic. There is quite a bit of variety to be discovered, so experiment and have fun. 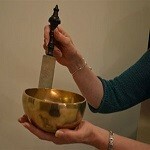 Every singing bowl has a spot which is the best place to hit it. Turn the bowl in your hand until you find the sweet spot – that’s the place where the vibration is most steady and smooth. The harmonic tones sound at more equal volume and the total sound is very harmonious and balanced. Many antiques don’t have a pronounced sweet spot – especially the thicker ones. The whole bowl sounds equally sweet and wonderful. As the tone fills the air, feel the vibration. Let the sound ring out and listen to how it fades. Sound travels. Imagine the sound flowing out into the world. 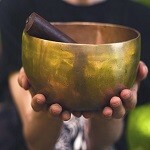 How do Himalayan Singing Bowls help in the healing process? It can be said that illness is a manifestation of dis-harmony within the body an imbalance in the cells or a given organ. Since all matter is energy vibrating at different rates, by altering the rate of vibration we can change the structure of matter. As per research shows Singing Bowls entrain the brain to move into the brain wave frequencies that induce deep meditative and peaceful states, clarity of mind, and intuition. The sound vibrations impact our nervous system, engaging our relaxation reflex and inhibiting the stress or pain response. A body is in a healthy state when each cell and each organ resonate in harmony with the whole being. Using Singing Bowls for healing is based on the idea that all illness or disease is characterized by a hindrance to the flow of energy in the body. When energy flow is hindered, the organ or tissue in question stops vibrating at a healthy frequency, and thus it results in some kind of weakness or illness. The sound frequencies created by Singing Bowls restore and optimize the flow of energy in the parts of the body where this is required. 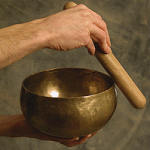 Singing Bowls are an ancient technology, about 2500 years old, for stimulating our brainwaves. Just like the new technologies of Brain. 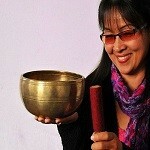 Singing Bowls create a pulsating tone, that feels good and helps you to relax. The more you listen the deeper you relax, as your brainwaves begin to entrain with the Singing Bowl’s tone. The benefit of this entrainment is that your brain waves can be the “TONED” so that you can deliberately experience pleasant and/or productive mental/emotional states. 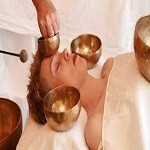 The upper end of the theta brainwave range is of great importance to healing the body, mind and spirit. At 7-8 (Hertz) cycles per second our deeper intelligence, creativity and self-healing mechanisms of the body are activated. This is what is commonly referred to as “Being in the Zone”. Singing Bowls can be used to put you into this special brain wave state that supports the achievement of your unique goal toward better health. Producing theta brainwaves through the use of Singing Bowls in conjunction with sophisticated audio technologies is facilitated through listening to the Healing Formations recording. Dr. Hans Selye, “the father of stress” was an endocrinologist in 1950′s who did research on the response of organisms to stress. He determined that stress is the underlying cause of all illness and dis-ease. His research was taken a step further by Dr. Herbert Benson. Dr. Herbert Benson of Harvard’s Mind Body Institute , has studied stress reduction for 35 years. Dr. Benson found that stress causes physical or emotional blockages. Dr. Benson found that stress reduction was essential to creation of health. He coined the phrase “relaxation response”. He defines this as “a physical state of deep rest that changes the physical and emotional responses to stress – for example: decrease in heart rate, blood pressure and muscle tension.” He also found that regular elicitation of the relaxation response has been scientifically proven to be an effective treatment for a wide range of stress-related disorders. In fact, to the extent that any disease is caused or made worse by stress, the relaxation response is essential to healing it. Hold your hand close to the rim. If your hand is several inches above the bowl, it’s difficult to make it sing. It is the pressure that produces the tone – not the speed. Slow down and apply even pressure. Sometimes there is one spot where the pressure is lessened – make sure to apply pressure constantly all the way around. If the bowl rattles, apply more even pressure. That rattling sound is the stick vibrating against the bowl. If the tone starts but then fades quickly, there may one spot where you let up on the pressure. When the sound comes up apply more pressure and speed up slightly: catch the wave. Some bowls sing very intensely. If the tone becomes too intense go very, very slow and apply slightly less pressure. Try a leather wrapped mallet which is more forgiving of the most powerful vibrations. Try different sized mallets and different types of mallets. Large bowls sing with a thicker diameter. Small bowls sing with thin diameter. Leather wrapped mallets work well to bring out the low vibration. Solid plastic rod can be used to bring out the highest harmonics.